The following summary updates the results of a previous ESG Economic Validation study that revealed the economic benefits of using Linear Tape-Open (LTO) Ultrium technology for long-term data retention. We have updated the model that formed the basis of the study to investigate the expected ten-year savings of using the latest generation of LTO technology (LTO-8), compared to satisfying the same requirements with an all-disk solution and with an all-cloud storage solution. We also discuss the advantages of LTO-8 technology and how they can contribute to a customer’s expected economic savings. Decreased capital expense, specifically related to hardware and tape media – LTO-8 technology builds on the inherent reliability and low costs of tape media, enabling organizations to lower hardware costs in their storage infrastructure. The higher capacity of LTO-8 media can decrease operational expense, as more data can be stored on fewer tapes. Decreased operational expense, including administration, support, maintenance, infrastructure, and data migration – Since an organization can leverage higher-capacity cartridges, less space is consumed in the data center. The smaller data center footprint reduces the amount of maintenance and support an organization purchases, as well as the amount of time that IT spends on tape storage administration and management. Improved business uptime, including less data risk, less downtime, and increased user productivity – Compared to disk-based systems, LTO-8 tape’s reliability and high transfer rates can help business uptime and lower recovery point objectives (RPOs) and recovery time objectives (RTOs), as data is less at risk of being lost while tape is less prone to failure. Thus, users can be more productive since they have consistent access to data when needed. Using the Economic Value model developed in the previous report, ESG Lab quantified the additional savings that an organization can now achieve with LTO-8 technology. This analysis is built upon ESG’s evaluation of LTO technology, in -depth interviews with technical stakeholders at the LTO Consortium’s member organizations (HPE, IBM, and Quantum), additional ESG qualitative and quantitative market research conducted with IT decision makers, and ESG’s general familiarity with data storage products and trends. We designed the analysis to provide a comprehensive picture of the potential direct and indirect cost and benefit drivers an organization should consider when comparing LTO-8 technology with current 2018 pricing for an all-disk solution and for an all-cloud storage solution. 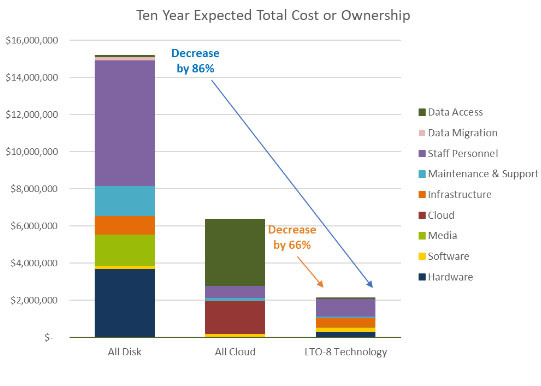 ESG then used the findings to generate a TCO/ROI model.This model predicts that an organization with an initial 1,000 TB of retained data, growing at a conservative rate of 10% annually, can achieve savings and benefits totaling more than $13.5M over a ten-year period when compared with an all-disk solution. The LTO-8 solution provides an expected TCO that is 86% lower than that of the all-disk solution. ESG’s model also predicts that an additional $406K in savings can be achieved over the ten-year period due to the decreased downtime resulting from the reliability of LTO-8 technology, along with the decreased amount of hardware to manage, which increases user productivity. With the high cloud egress costs associated with data retrieval from cloud-based storage,we estimated that the LTO-8 solution’s expected TCO is 34% of the all-cloud TCO over the ten-year modeled period . Over an extended period, LTO technology offers a reliable and cost-effective data retention solution compared with current generations of all-disk and all-cloud storage solutions. The latest generation, LTO-8, offers the reliability that organizations expect from tape media, while offering increased capacity and performance at a lower price per TB. ESG validated that a modeled organization can lower its overall storage costs due to reduced hardware and mediarequirements, thus decreasing infrastructure, maintenance/support, and administration costs. For our modeled scenario, we estimated that the expected ten-year TCO for the LTO-8 data retention solution is 86% lower than that of an all-disk solution and 66% lower than that of an all-cloud storage solution, making LTO-8 the economical choice for long-term data retention. Contact your BackupWorks.com Account Rep today and ask about LTO-8 Technology!